Join the discussion on our forums! 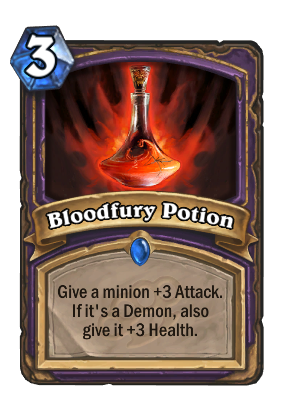 Come discuss Bloodfury Potion over in our dedicated Bloodfury Potion discussion topic. [x]Give a minion +3 Attack. You know what really makes my blood boil? The skyrocketing price of Bloodfury potions! I ship it with Demonfuse, anyone wanna help me write a fanfic? Against all logic and reason, I'm actually finding this to be a good card in demon zoo. An early 4/6 Malchezaars imp or voidwalker seems to be really difficult to deal with for most matchups. What a golden animation wasted! Is it just me or is this card TERRIBLE? Drrriiiiinnkk, Grommash Hellscream. Claim your destiny! We never see this card. We have Demonfire , why do we use this garbage? Would Djinni of Zephyrs gain the health bonus if this spell was used on a friendly demon? Why are you upset that Warlock is getting a variety of different cards? One aggro card doesn't mean all the rest of the Warlock cards are for aggro. everyone seems rely upset about this card. using claims like "cold blood and blessing of kings cost 1 mana" what i don't get is why that means anything for warlock. But giving +3 +3 for 3 mana is what should be baseline. It should not be a conditionnal reward. Actually, +3 +3 for 3 mana is not that amazing. This card is +3 attack for 3 mana, or +3 +3 in specific decks. That's just plain bad. Oh and it is a buff to the minion, it doesn't heal the hero, it would have been specified clearly if it did.